sold 10 sets per package. 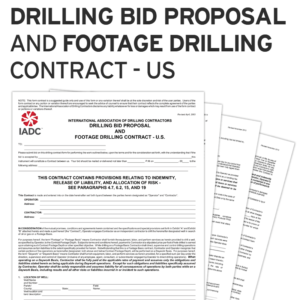 With important changes and the first major update in a decade, the IADC Daywork Drilling Contract Land US provides for drilling operations conducted on continuous per-day price, from start of the well through final depth. The new form, bearing the revision date, November 2013 was updated by the IADC Contracts Committee to include several revisions to address latest case law and to more clearly address its usability for multi-well and term period contracts. Also available as an electronic form through High Tech Forms.